Peugeot 3008DKR-privateer Sheikh Khalid Al Qassimi and his navigator Xavier Panseri from Abu Dhabi Racing began SS12 as 8th, the position he finished the previous day but eventually classified a place higher in 7th overall. 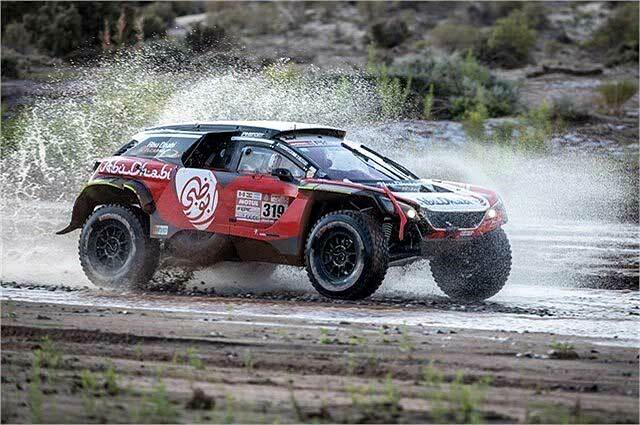 Displaying consistent form on the longest stage of the 2018 edition of the Dakar at 523km, Sheikh Khalid was fighting for 6th place with Mikko Hirvonen, but finished 7th, just 18 seconds behind the X-raid pilot from Finland. "We started the day having some difficulty with the navigation in the beginning and we hit trouble where there was a lot of water," Sheikh Khalid reported. "After we passed the river the car stopped. I had to reboot the car and keep going again. Five kilometers after that, the car stopped again, perhaps the water had affected the electronics of the car, I'm not sure exactly. We then started again but in the process lost a few minutes." "The navigation was difficult. My co-driver struggled a bit with the navigation and there were places where we lost quite a bit of time. That was at the 288km stage, and then we had the liaison in between. The last section of the stage, which was 243km, we carried a good pace and caught up with the car in front of us driving in his dust. At this stage, unfortunately, we missed a junction and then again we missed a junction on the last section. It was quite difficult with the navigation. But for sure my co-driver is better than the one last year."